A Man, A Winter, And An Internally Illuminated Portable Marquee…Book Deal! It Can Get Pretty Boring in Winter, Buy An Internally Illuminated Portable Marquee and See What Happens. No, that’s not hyperbole, it’s the name of John Getchell’s book. The first thought that came to Mr. Getchell’s mind was to find the letters and write something inappropriate, step back, and watch for drifters. Of course, he couldn’t find any letters. But he did find genius. 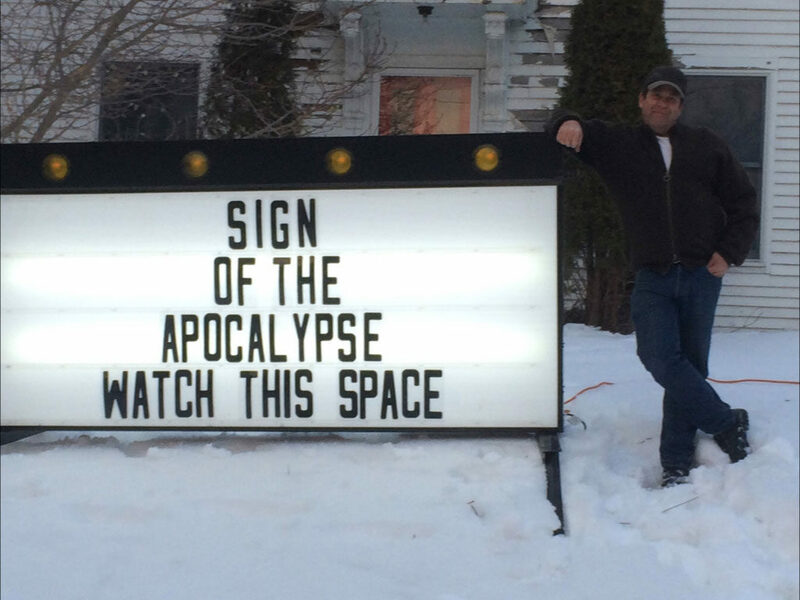 He bought the sign, created some rules for himself and for the past 2 years he’s been proselytizing the ironic, the outrageous and the comic genii that stirs in all of us that live through the dread and cold of February’s breath. Mr. Getchell placed his sign in front of his house in Arundel let the letters share his comic genius. Tour buses sometimes slow down so to read the sign. He’s LEGALIZED MARINARA and wrote to STRIKE THE IRONY WHILE IT’S HOT. He even got a book deal out of it.